This week we close the door on 2013 and open a new one to 2014. Seems like only yesterday that people were worried about the world coming to an end, computers crashing, and what to do with all those checks that still had 19__ on the date line but wait that was fourteen years ago. I was a sophomore in high school back then… a long way off from being a wife and mom to one two girls and having this little blogging gig on the side. With all that being said I thought it would be fun to look back over five of the most popular topics from this year as well as the top five most visited posts this year here at Color Transformed Family. Adoption Story I have truly enjoyed sharing our adoption journey with y’all and thankfully you guys love hearing about it. That little “Hong Kong Adoption” tab has been one of the most visited spots here on the blog this year. The cool part is that God has used it to connect me with so many other families who are adopting and a few of them are adopting from Hong Kong as well. It’s so exciting to e-meet others whose children are coming from the same orphanage as Esther. 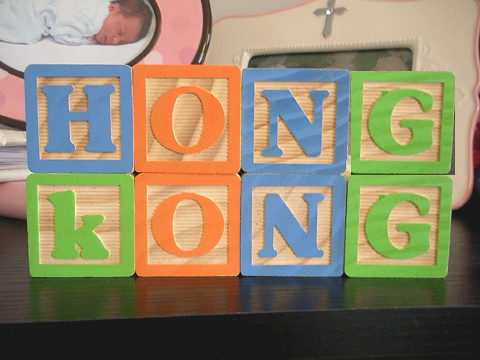 Hopefully, there will be some play dates with them once we all get our children home.I will continue to share our adoption journey on in to 2014 as we take a short trip over to Hong Kong and then once we are back and adjusting as a family of four. 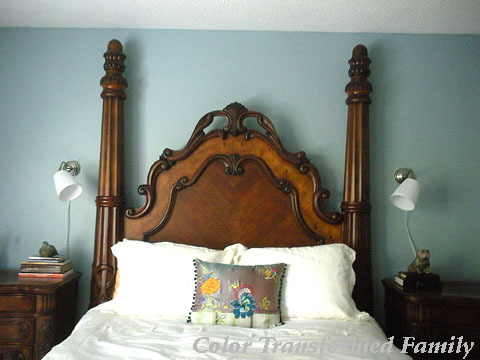 Who doesn’t love knowing what a paint color looks like in a room before purchasing it? Our Alpaca cabinets have generated a lot of traffic from Pinterest. People love to know what a paint color looks like before committing to it. As for us… we love our Alpaca cabinets. It’s amazing how much bigger our kitchen feels with lighter walls and cabinets now… not to mention that awesome subway tile back splash. Hopefully, 2014 will bring a few more yellow accents to the kitchen… possibly a yellow cookie jar in the back corner and yellow dish towels for the stove. I love decorating our mantel each season but by far my favorite is Fall and this year was no exception. Thankfully, you guys liked it too. 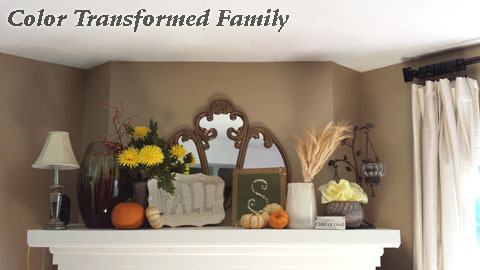 My favorite part about decorating our mantel is the instant change you get in the room without hardly spending a dime! Our Alpaca cabinets weren’t the only thing receiving all the attention in the kitchen. 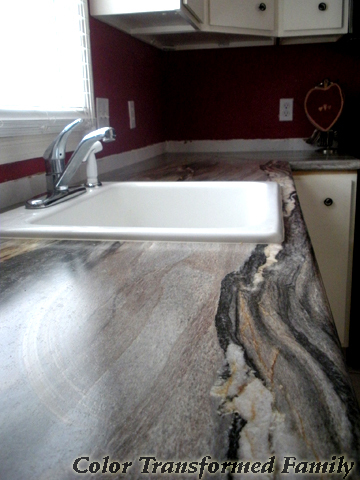 The 180 FX Dolce Vita counters by Formica turned a few heads as well. I’m not surprised by that because they turn my head every time I come into the kitchen. Pictures don’t do them justice. They are beautiful! 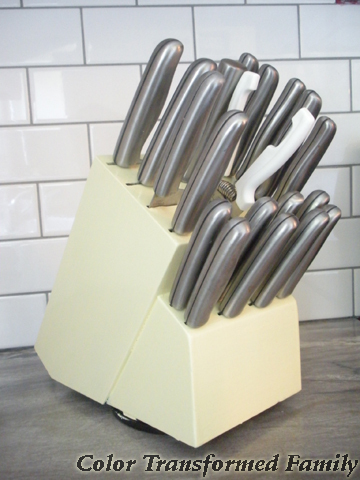 And were the perfect solution to our kitchen makeover on a budget. Especially for our little house where we hope to break even when it goes on the market in the next year or so… thanks a lot “great recession”. 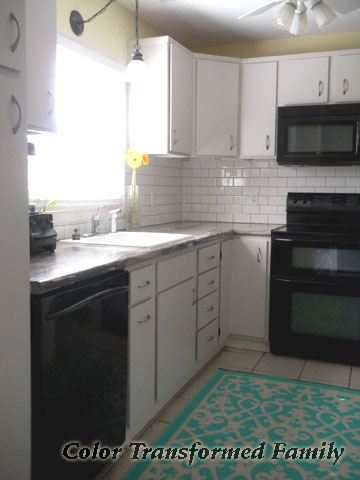 This was such an easy project and a great way to use up left over paint and add in a little accent color to the kitchen. I seriously never expected this post to be as popular as it is. 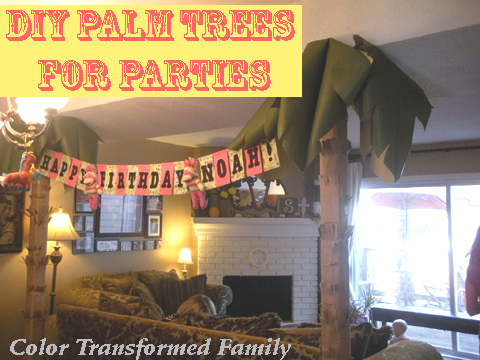 “DIY Palm Trees for Parties” is the most visited post here at Color Transformed Family. Sometimes you just stumble across a topic that you didn’t know people needed information on… and for that I am grateful. Here’s to all your parties decorated with beautiful fake palm trees. I’ve even found myself revisiting this post a few times. Why? Because this method works. Two years in now and the paint on the dresser is still holding up great… and it’s taken some beaten. One of my most favorite DIY pieces in our house. I love this table! I love that I can draw on it and I love that it is white. It makes our dining room look bigger than it actually is. Hopefully, in 2014 I can get my act together and work on the some DIY bench seat covers. I bought the fabric this Fall in amidst all the doll house construction turned Christmas preparations and haven’t gotten around to starting on it yet. 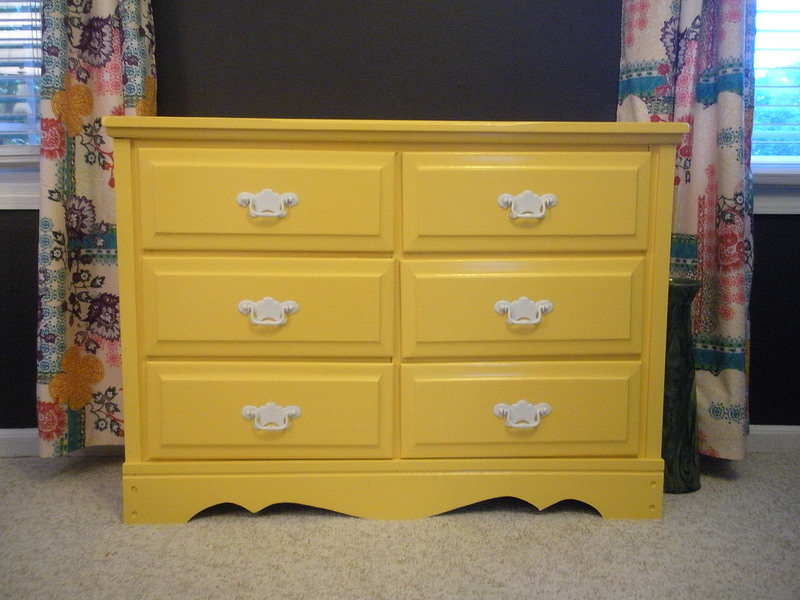 Another great post for seeing what a paint color looks in a room. Sherwin Williams Rain has been the perfect color for our bedroom. I love its peaceful vibe and how it changes colors throughout the day. In the mornings it almost looks grey but at nighttime its a beautiful calming blue. Here’s another post that I never expected to generate so much traffic. 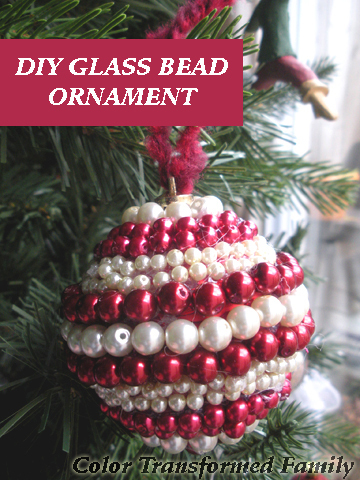 These DIY Glass Bead Ornaments were quick and easy and perfect to give as gifts… because who doesn’t love a hand made gift? Ok. 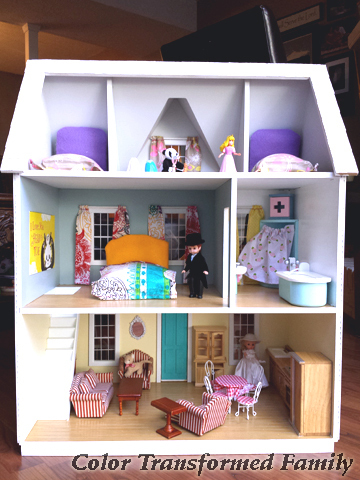 I just had to share my personal favorite post of the year… Noah’s dollhouse tour. This project took a good fourth of the year to complete but was so much fun! I love seeing her playing with it. Moving all the furniture around. Finding pandas and rabbits in the bed instead of dolls. It’s so much fun to see her little imagination at work. Looking back it looks like we spent a majority of the year remodeling the kitchen.. and I would say that is about right. Our kitchen remodel has been a slow but rewarding process and hopefully we can wrap this reno project up in 2014. So what does your 2013 in review look in review? What exciting and amazing things happened in your life? What projects did you finish that you are so glad you won’t have to deal with in 2014? I hope every one has a safe and wonderful Happy New Year! Any plans? We don’t have any yet. More than likely we won’t even stay up until midnight… what’s the point when you know your toddler will be up bright and early in the morning! This entry was posted in Color and tagged 2013 Review, most popular posts on 12/30/2013 by Krystle. This is a great post for me to read. Since I am new to your blog it has helped me to” catch up”. Everything looks great but I especially like your kitchen! If you get a chance I would love for you to stop by and check out my blog ecofriendlyhomemaking.com I am having a giveaway of all natural organic skincare products! Thank you, Alicia! Welcome to Color Transformed Family… this is the perfect post for you. I will definitely check out your blog. Organic products are right up my alley. Happy reading! I love your chalkboard table. And I love that it’s a light color. I’m actually repainting our dining room table this month. (I hope?) You are inspiring me because I’m going light, too. I went dark four years ago and it’s time for a brightening. Looks like a wonderful year! Here’s to 2014! Thanks! 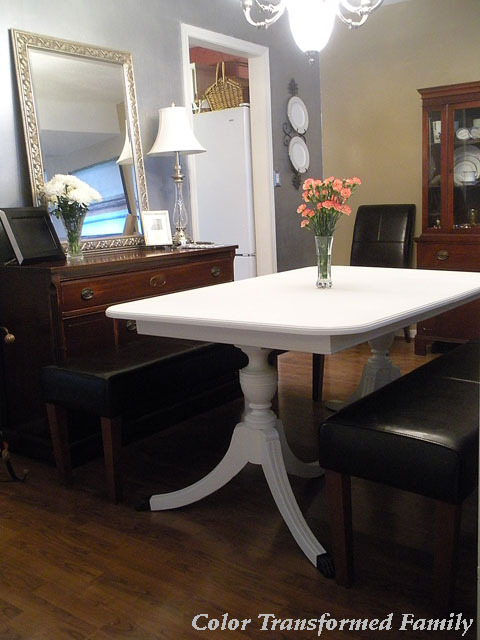 Our dining room is extremely small and its amazing the difference a light table makes. I look forward to seeing how yours turns out.